The first thing you may notice is the additional header pins supplied with the board. These can be fitted to the row of headers that we have added alongside the standard Arduino headers giving it more connect-ability. Add them to the upper side of the board to have additional connections to each pin, or add them to the bottom to get access to pins obscured by shields. We also know that when experimenting you can never have enough power connections so we've added a header with plenty of 5V, 3.3V and GND pins. Plus added pins for Serial and I2C interfaces. We've even improved on the standard artwork to make it clearer, and on the underside we've also added extra information for alternative pin functions - very useful if you like to hack your Uno. We've changed the USB interface to lower the cost of the board. But don't worry, despite all the improvements it's still an Uno. 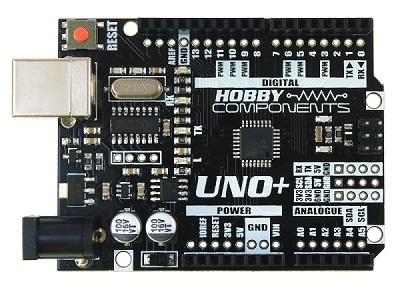 It will work just as well with the Arduino IDE and is compatible with any hardware that works with an ordinary R3 Uno. Just install the drivers (see links below) and select the board type as 'Arduino Uno' and you're good to go. This product is derived from the Arduino(TM) reference design which was released under the Creative Commons Attribution Share-Alike license. 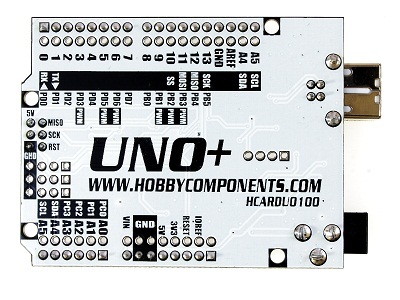 Technical support for any product sold by Hobby Components should be directed to Hobby Components. We have no affiliation with Arduino. Drivers are available in the link below. Simply download and unzip them, plug in your Uno+ and when the new hardware is detected, point the wizard to the folder you just unzipped to and it should install without any problems. 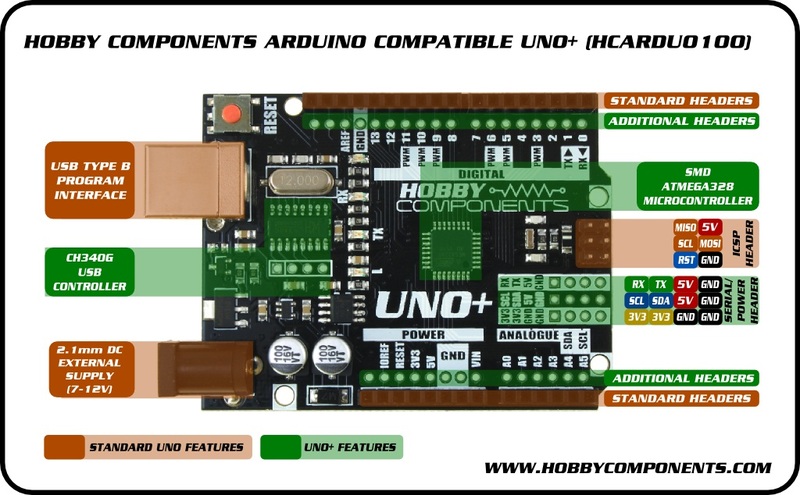 Mac users will probably find that their Hobby Components Arduino Compatible Uno+ (HCARDU0100) is not recognised properly in the Arduino Dev Environment in OSX El Capitan. Just got an Uno Plus and can't wait to check it out. First thing... the onboard LED that indicates "on" status is far too bright. Not to mention that it is red, which indicates a fault in pretty well every visual vocabulary! So, first, is there any way to disable it? Temporary or permanent solutions welcome. Second, you should consider replacing it with green or white in future iterations. Thanks for your feedback, we'll take it into consideration. OK electrical tape it is! Thanks for the quick reply. Was kind of hoping for an assembler hack. Hi..i am new here. First of all thanks for posting a helpful information here. I want to know that the onboard LED that indicates "on" status is far too bright. Not to mention that it is red, which indicates a fault in pretty well every visual vocabulary.First, is there any way to disable it? Temporary or permanent solutions welcome.Also you should consider replacing it with green or white in future iterations. Last edited by AlfeSande on Wed Jul 06, 2016 3:24 pm, edited 1 time in total. Thanks for the feedback. We will soon be coming to the end of our current production run at which point we'll have an opportunity to make minor modifications. We'll take the suggestions about the power LED into consideration. There is no way to disable the power LED without making modifications to the board. I.e. removing either the LED, its current limiting resistor, or more permanently cutting a track. As mentioned in my reply to rparmar, probably the best non-permanant way to dim the LED would be use a indelible marker pen to colour in the LED. Just bought one of these boards, but trying to programme it from Linux seems like a non-starter (unless I'm missing something). I can probably develop my code on a genuine Arduino Uno (that works beautifully under Linux) and then port it via a borrowed computer but that's a major pain. Shame as it appeared like a promising alternative.